Making sure your cat stays physically fit isn’t the easiest job in the world. 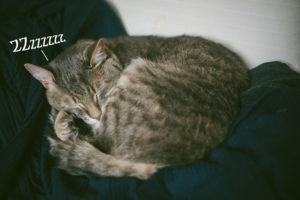 If you have a cat who’s lazy like mine, you may find the job is even harder for you than keeping your cat at a healthy weight, which can actually be very easy and free to do if you make use of this simple trick for preventing overfeeding, even while delving out as many snacks and meals throughout the day as you’d like. But exercise – that’s another kettle of fish entirely. I’ve written an entire post about helping your cat exercise more, but I honestly feel like a lot of what quality exercise comes down to for a cat is getting the types of cat toys you have right. A lot of the toys my own Avery is happy to engage with are ones that involve food: toy balls he has to poke to get food out of, digger toys he can pull food out of, food trees he can pull kibble from, or combinations of the aforementioned methods into one cat toy. The reason why is simple: he loves food, he’s motivated to get, and thus he’ll play with these toys because the motivation to eat spurs him to action. These toys are great, and they’re lovely to have around to keep him mentally stimulated. But the issue with him only engaging with these types of cat toys is that none of them help him release energy, be incredibly physical, and thus stay fit. So I often find myself in a bit of a bind. 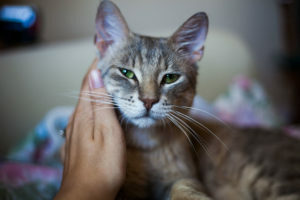 Not exercising enough can lead to physical issues like constipation and (if the constipation is bad enough) vomiting, as well as behavioural issues like aggression to other cats and humans, hissing, and a slew of others that sometimes result simply from not getting all that pent up energy out. No one wants that for their pet, but with cats being so exceptionally fussy about toys sometimes, it can feel a little overwhelming finding quality exercise toys that will be engaging at all, let alone ones that simultaneously also do a good job of releasing high levels of energy. Thus spurring my desire to find the best cat toys I can to fulfill both these criteria. 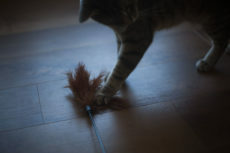 If you know of an excellent, high-intensity, highly engaging cat toy – please list it below! 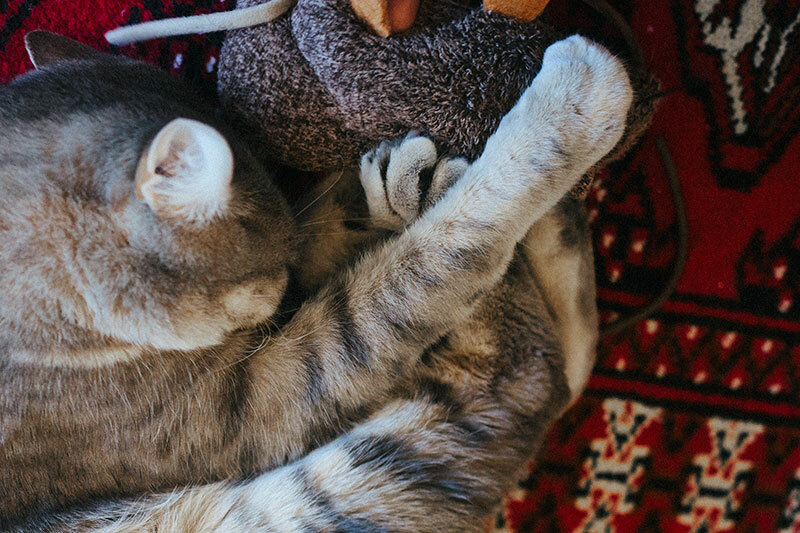 Whether or not it’s in this list, please do mention it, as the more votes we have for certain toys, the more likely it is some of our more fussy cats will also take to these ever-so-important toys to have in our toy dressers. Need tips for encourage a cat to play with these toys? Check out this article here. In the meantime, let’s get into what I’ve found to be some of the most highly recommended products for this purpose in the industry. 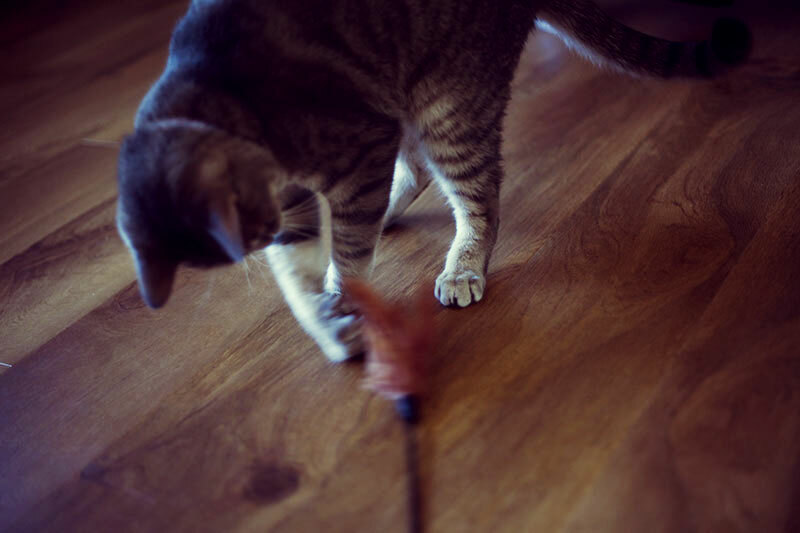 There aren’t many cat toys that are as high energy as feather cat wands on the market, and this particular one is probably the most highly praised I’ve encountered. There seems to be something ever-so-engaging about the Da Bird wand; maybe it’s the way the heads are designed? I’m not sure, but it’s one of those cat toys I really haven’t heard many criticize. You should know that with every single feathered item you buy, eventually, the feathers will be used to pieces. Cats go nutty for feathers typically, and they normally won’t stop playing with a feather toy they love until most of those feathers are plucked out completely. Luckily, Da Bird wands never have to be completely replaced, as you can “top up” with refill heads when the feathers have been clawed to pieces. This and the toy in spot #2 are probably the best exercise toy options for very fussy cats like my own. I can’t count the number of times I’ve been recommended Neko Fly wand toys before. They’re like feather wands, but without feathers, and instead come with replaceable heads in the shape of large insects (that don’t look too gruesome don’t worry!). These things really seem to strike a chord with difficult-to-engage cats, so again, do give them a try if you have a fussy cat like me. They may not work, but because so many pet parents give them the thumbs up of approval, they really are worth a shot. They seem to be incredibly durable compared to their feather-wand counterparts, but if you have a cat who will play with next to nothing, I would still try to have both around. It’s definitely advisable to have more than one cat toy around your cat will actively engage with, in case for some reason he or she’s not in the mood to play with their usual fave. There is absolutely no doubt in my mind you already know about cats loving lasers, but they’re still worth a mention up at the top because of how much cats typically jump, run, and physically push themselves to chase these things around, especially if you’re the one behind the toy. 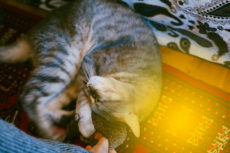 Do your best to have your cat chase the light up furniture that’s cat approved, like chairs and dressers, up and down long hallways, up and down cat trees, and potentially even carpeted stairs (if your cat is careful and not going to hurt themselves). There are so many ways you can make lasers more interesting when you’re in control of them. 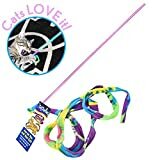 I’d recommend really utilizing this cheap, ubiquitous high-energy cat toy if your cat easily goes after the light, maybe even having a laser in each room in case your cat gets that mythical burst of energy and you want to quickly take advantage of it, and definitely having a few spares as, I don’t know why, but it always feels these toys easily get lost. You can absolutely try the automatic laser toy varieties. 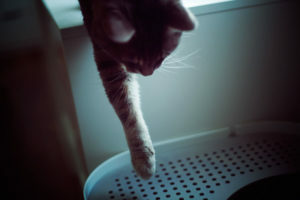 Some include: the Frolicat Bolt (reviewed here), the Friends Furever Interactive Laser, the Felix & Fido Playdot, the Petsafe Dart, and the Petsafe Dart Duo, but know that while these are great for if you’re in a pinch and just are too busy at the moment to play with kitty, nothing is going to beat manually moving the laser yourself. It just can’t. I spoke about these briefly in my article about remote control cat toys. I have no idea if they’d be any good for cats that are difficult to engage, but they do look like they’d be highly engaging. Certainly look high-energy intensive to me. The fact that they’ve got a furry bit at the end of them to grab a cat’s eye means they’re likely far more enticing than the typical remote control mouse. A great alternative to automatic lasers since they require no human intervention (besides turning them on and grabbing them from under the couch if/when they get stuck). Close to perfect if your cat happens to like them, in my opinion. These toys are a godsend for many pet parents. They’re ridiculously cheap, pretty darn durable, easy to replace and to always have scattered around the house, and they’re the type of cat toy a kitty can play with on his or her own, no human intervention whatsoever needed. 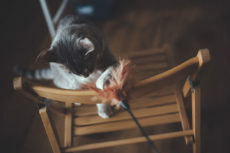 There are a number of other cat toys ideal for kitties to play with when home alone, and typically those are ideal for keeping your cat fit and active without your help. 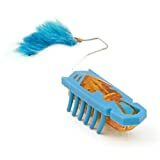 But many of those toys, like these here springs, also work exceptionally well at engaging cats if you throw them across halls or bounce them on floors and walls to get your cat’s attention on days your cat is being difficult about playing on his or her own as well. Avery used to adore these springs and would sometimes bat them across the room and chase them by himself, but nothing did it for him quite like me throwing them for him to catch myself. Sadly, even when I try to play with them with him, he’s no longer much of a fan of these, which I wrote about in my review of the product. 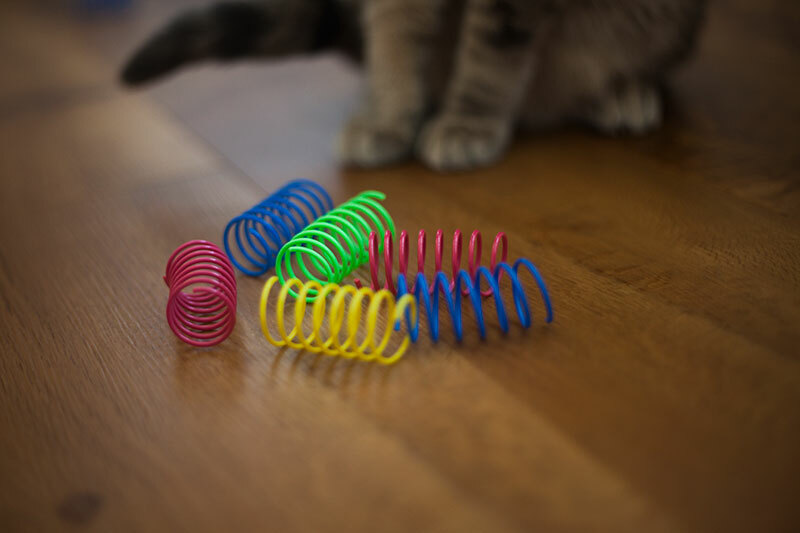 If I could get him to love any cat toy again, it would 100% be these springs. Hoping if we move to a house that’s got more space, and less chance of him ramming into things, he’ll give these another go. 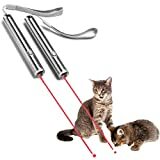 A pretty unique cat toy, and I’ve heard ever so many pet parents rant and rave about how it strikes the fancy of many difficult-to-engage cats. I’m not sure what about it in particular is so interesting to cats, maybe it’s just down to the fact that the texture is cardboard-like and it’s small and can look a bit like a bug, but either way, these seem to be wonderful for getting cats to leap and jump and chase after. Again, do your best to run it across long hallways and pull it up and down cat trees and cat-approved furniture like dressers and chairs. Not sure how durable these are but since they’re so ridiculously cheap, I don’t think them breaking would ever bother me much. 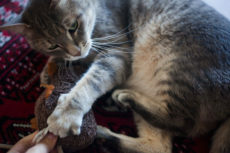 Now, this may not look like an energy-intensive cat toy at first, but looks can be deceiving. My brother‘s cat Beau loves this tower of tracks, and will play with it by himself. But the way he does so is interesting: he doesn’t simply poke at the balls, he’ll run past the toy, hitting a ball on his way past, then run back, hitting a ball on a different level. I really need to grab one of these to try with Avery, but sadly, he isn’t typically interested in ball track toys. May wait to get one of these ’til we get a second cat. One way you may not yet have discovered that cats often like to get a whole lot of energy out during play is by bunny kicking their toys. 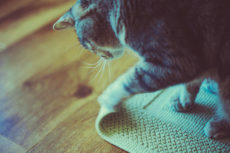 I’ve written up a whole article on various cat kick toys you can try, and yet the one I’m recommending here is not really a true cat toy, but a “found” toy from a common object. Still, it’s what my Avery is obsessed with kicking the most. Although he’s terribly fussy and rarely ever likes to play through running or jumping, I found if I push him over onto one side, push a cat kick toy like this wool dryer ball or the Petlinks Jeepers Creepers rat into his hind legs, he’ll typically grab onto the kick toy with his front paws, then bunny kick to his hearts content. If I do this over and over, he’ll usually get hyper enough to play some other way (his second favourite way being grabbing the back end of a feather wand poked under a little bath mat we keep for him to play with). But even if he doesn’t get to stage 2 of play time, the kicking exercise is usually enough to help him quite a bit of energy out. Give it a try. 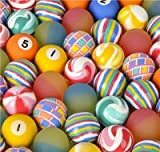 Bouncy balls are tied for the #1 spot with springs with regards to the cheapest and easiest way to get your cat to potentially play by him or herself in a way that’s very high-intensity and incredibly beneficial toward the goal of staying fit. My mother’s cat Walker is obsessed with bouncy balls, and even goes so far as to dig out balls from his cat toy basket, soccer kick them down halls and chase them by himself. He also never refuses to play with them when we throw them down hallways or bounce them against walls to play with him ourselves. Yes, they’re basic, and you might think your cat will be disinterested in them, but you never know until you try! Tried bouncy balls and find your cat loves them? Try crinkle balls or some of these other variants on toy balls for cats as well. More variants of the same theme is a good rule of thumb to follow in finding a slew of cat toys your cat will also be interested in. Yank-on-a-string cat toy, pretty much! Ideal for encouraging cats to jump and honestly should do the trick for a lot of cats. They are prone to breaking, however, so be aware of this, especially if your cat is a little rough with toys. Worth a shot, in my opinion, because they are great if your cat will play with them – no human engagement whatsoever, not even an on button, needed! 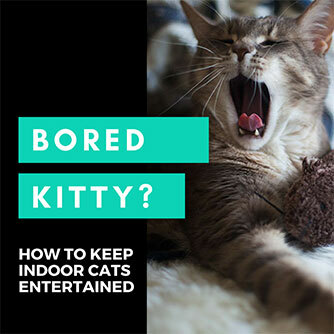 Perfect for kitty to entertain him or herself while you’re at work. Of course, if your cat loves feathers, there are always automated versions of feather toys you can try. 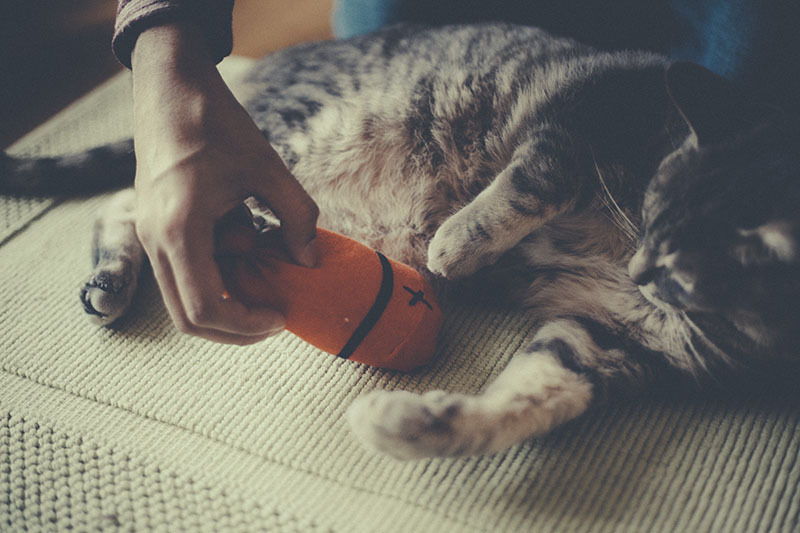 Again, nothing will be more entertaining than a human behind the toy, but if you’re looking for interactive cat toys that will entertain your cat with no human interaction (besides pressing an “on” button) needed, these are certainly ones to try. Which reminds me, I need to get my hands on one of these to review! Now, this cat toy isn’t supposed to be as good at engaging as #1 and #2 on this list, but they are supposed to be pretty damn good with many cats. If you have a really difficult-to-engage kitty, I’d try the other two options first, but if your cat is not too bad with starting up play time, and you’re looking for a cheap, durable toy that always makes for a great back up in case you run out of feather toy heads, or just need another high-energy toy in the rotation, this is perfect. I used to have one of these back in Canada, but Avery stopped using it, so we “donated” it to my mum’s cat, Walker, since he plays with nearly everything! Avery loved this when we first got it, but after a few months, gave up on it completely and wouldn’t go near it. Walker still plays with it years later, nowhere near as regularly as when he first got it, but it’s great for when you’re in a pinch and need something to distract a playful kitty while you work. Worth a shot for sure on the off chance your cat loves it. Cat toys aren’t the only way to get your kitty moving! There are plenty of cat “furniture” pieces that will encourage your cat to play, even while you’re not around. Obviously, the first thing that would come to mind when thinking of cat exercise furniture is the cat wheel, but while these look amazing to us humans, they’re pretty expensive on the whole, and there is a chance your cat might not like using them. The alternative, and probably the best cat exercise furniture you could grab: a crazy cat tree like this one. 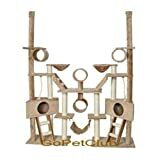 The bigger the better, which is why, if you have extra space, having a massive cat jungle gym is probably the quickest and easiest way to get one or more cats to exercise way more frequently on their own. Don’t have the space for a giant cat jungle gym? 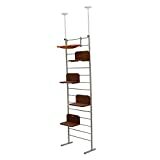 There are plenty of narrow cat trees ideal for small spaces or for those who (like me) live in a small apartment or flat. Small cat trees are pretty great for this purpose as well, as are cat shelves and cat climbers. 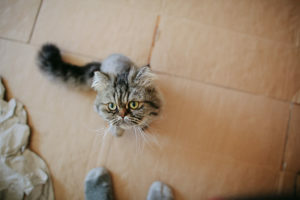 You get that vertical space going on, and believe me – your cat won’t even notice the fact the apartment is a bit tight. Adding vertical space is like adding a loft bed or a bunk bed to a room – you get way more space to stay in and use, even though the room itself isn’t any bigger. Still worried your cat isn’t getting enough exercise? You always have the option of working this simple cat workout into your cat’s daily routine – my advice is to use this workout right before feeding meals! Need even more help in this department? 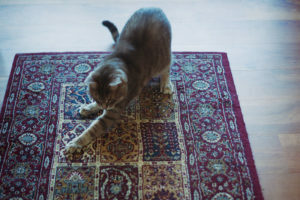 Find it’s particularly hard to get your cat moving? 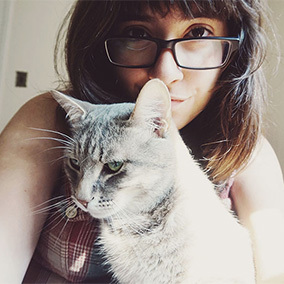 Check out my comprehensive article on getting cats to exercise. 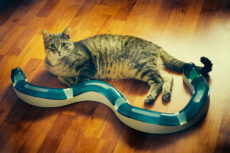 What Are Your Cat’s Favourite Exercise Toys? Have any of the toys listed above? Have some others that really encourage your cat to play? 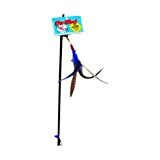 Do let me know which cat exercise toys strike your cat’s fancy! Would love to know so I can prioritize grabbing those over ones that are less likely to be engaging. Any advice you could give would not only help me out with finding more engaging toys for Avery, but would also help other pet owners in similar cat-needs-more-exercise types of situations out, so please don’t hold back! Thank you so much for recommending them! Will need to grab them to review. I need to stop forgetting to add to cart!